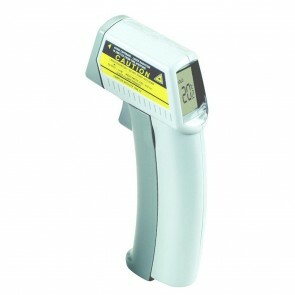 Take quick temperature readings with this easy to use infrared thermometer. It enables safe temperature measurement where non-contact access is required. Note: Colour may vary according to availability. Our infrared thermometer range includes pocket size instruments, larger "gun style" thermometers and infrared thermometers which incorporate a penetration probe to provide even greater temperature measurement flexibility. 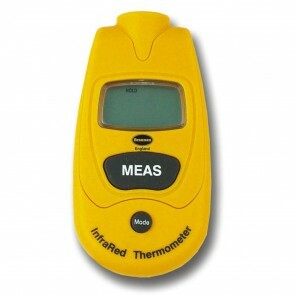 An Infrared thermometer provides a quick and easy method of temperature measurement. As they are non-contact instruments they can be used at a safe distance from the object being measured. They also generally have wide temperature measurement ranges, often well over 1000°C which means they are very useful in industrial applications, for example measuring heaters, ovens and engine temperatures. However they are only capable of taking a surface temperature and this may not always be representative of the internal temperature of an object. For example, as you cook food the part nearest the heat source e.g. the part in contact with a pan, will heat up first and be much hotter than the upper surface which is furthest from the heat. If accurate core temperatures are important then an infrared thermometer with a penetration incorporated into the design is the ideal solution. 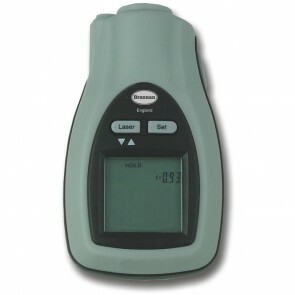 A key specification of infrared thermometers is the field of view (or distance to spot ratio). This is a measure of the diameter of the temperature measurement area, compared to the distance between the thermometer and the object being tested. For example, if you had a thermometer with a D:S of 6:1 and you held it 6 inches from the test object it would be measuring an area one inch wide. At 12 inches away it would be measuring a 2 inch area. Infrared thermometers are not the most accurate type of thermometer. They are usually quoted as being accurate to around +/- 1 or 2°C. There are number of reasons for this but the emissivity of the material being tested (the efficiency in which a particular surface emits thermal energy) makes a significant difference. Some infrared thermometers feature laser alignment. Laser thermometers send a beam of light onto the surface being tested which will show the exact point being measured.